Founded in Madrid in 1959 under the auspices of the United Nations, the International Olive Council is an international intergovernmental organisation bringing together olive oil and table olives producers and consumers. On the 15 of July 2016 in Tunis, Mr Abdellatif Ghedira, Executive Director of the IOC and Mr Cosimo Lacirignola, the Secretary General of the CIHEAM signed a Memorandum of Cooperation to strengthen their joint activities that contribute to the sustainable development of olive growing in the Mediterranean. Following the regional workshop on the Xylella Fastidiosa organised by the CIHEAM and the IOC in Bari in November 2016 intended to provide members of the IOC with the most updated information on this issue that is severely affecting Mediterranean olive trees, discussions were held on the setting up of an olive oil observatory and the establishment of a network for the conservation of genetic diversity. 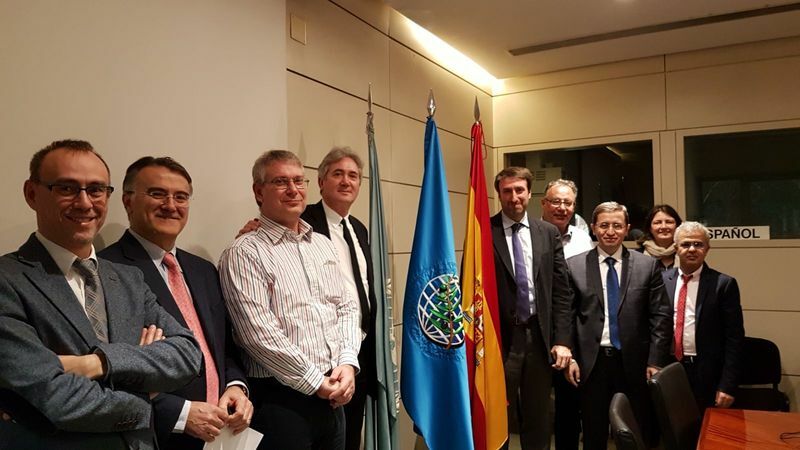 Mr Placido Plaza, Secretary General Ad Interim of the CIHEAM, and a CIHEAM Delegation were in Madrid for a meeting with Mr A Ghedira, Executive Director of the International Olive Council (IOC)to strengthen their partnership and plan future activities. Common actions against the Xylella Fastidiosa, collaborations on germplasm management, physicochemical analyses, tasting panels, capacity building (MSc and specialised courses) and the implementation of the Olive Oil Observatory were among the items discussed. The meeting was also the occasion to exchange on the Mediterranean Olive Tree day. IOC and CIHEAM strive to raise awareness on the role and importance of the olive tree in the Mediterranean but also on the dangers that threaten it. A symbol of peace and resilience of territories, an instrument of sustainable social and economic development, an agent of the struggle against climate change and an ally of health and nutrition, the Mediterranean olive tree will have a dedicated day, during which the CIHEAM and IOC will present their joint activities for the improvement of the olive sector in the region. Founded in Madrid in 1959 under the auspices of the United Nations, the International Olive Council is an international intergovernmental organisation bringing together olive oil and table olives producers and consumers. On the 15 of July 2016 in Tunis, Mr Abdellatif Ghedira, Executive Director of the IOC and the late Mr Cosimo Lacirignola, Secretary-General of the CIHEAM signed a Memorandum of Cooperation to strengthen their joint activities that contribute to the sustainable development of olive growing in the Mediterranean.